Onyx has officially released a new fairly major software update for the Onyx Boox Note models (Note 10.3, Note S, Note+) and the Onyx Boox Max2. The new 2.0 software version adds a new user interface and some new features, including a number of new options with the notes app and they finally added two-page landscape view. You can find the update files on Onyx’s website, or you can auto update from the settings menu on your device. I installed the update on my Onyx Boox Note over the weekend and so far I absolutely hate it. The text seems thinner and more washed out, for one. The new shop section is just pointless nonsense to anyone who doesn’t read Chinese. The Kindle app no longer works. It loads fine but page turns don’t register anymore, rendering the app useless. Google Play is gone and you have to go through the hassle of setting it up again. Dropbox was removed from Note syncing so I had to set that up again too. There are some other minor annoyances as well that makes the new software seem rather amateurish, but I’ll give it a week or two before deciding to go back to the older software or not. If you missed the earlier post, it includes a short video showing off some of the new features. Please don’t install it, it would break Google Play and all other Google products. Kindle, Play Store, Dropbox integration… All show stoppers for me. If this is not corrected any time soon (i.e. those items become “feature” not bug) I am not going to update any time soon. Also, for sure I am not going to recommend it to anybody (au contraire). Is there any explanation from vendor side about these “decisions”? I had none of the issues everyone is experiencing here. To enable google play, go to the apps menu in settings. You don’t need the patch app from onyx app store. In fact, Onyx advises to do so. I have a Note+, every default app is smoother and faster than before. The Android apps can be optimized as well. The Amazon app works flawless and libby too, playing a bit with the optimization settings. I only miss the AI handwriting recognition, which was promoted in the video of the 2.0 update. But Onyx says they’re still working on it. I have gone to apps menu and enabled Play Store, yet it doesn’t work. The method, you are suggesting worked at the time of last update. However this time, nothing works. Any ideas on how to make it work. I managed to get my Kindle app working again by doing the following. On the Boox home screen select “Apps”. Find your Amazon Kindle app and press and hold until a menu opens. Select “Optimize” on the menu. On the page that opens select the checkbox next to “Use Regal Refresh Mode”.Tap the back arrow next to Amazon Kindle and you will return to the Boox Apps page. At this point my Kindle app would turn book pages when I swipe from right to left or left to right. I have not tried the other optimization settings. Thanks for the tip! I’ll have to give it a try. I tried one of the other Kindle apps in the appstore (there’s like 3 for some reason) and it was the same problem. It wouldn’t be as bad if Onyx bothered to mention this stuff in the changelog before updating. 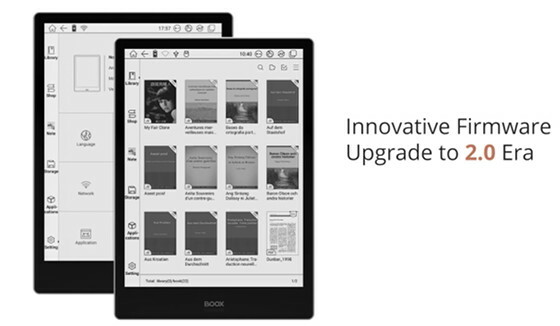 Thanks – Kindle app now works. Ýour suggestion “Use Regal Refresh Mode” setting works perfect for me on Onyx Max2 Pro with latest version (2018-12-26_19_06_2.0.1). I also changed the Font Size to 207 DPI. Nathan, can you do a video on the onyx max 2 HDMI display speed difference with the update, or have you seen a video with it? Sorry, I don’t have a Max2. I don’t see where that was mentioned as being improved with the update. Any update on this now? Is it ok to update, or do these problems still exist? No, just be prepared to spend some time setting up Google Play again, signing in to Dropbox again, and having to tweak apps to run properly that worked fine before. I am hating this 2.0 update! It is awful and a huge step back in terms of usability. I can live with the dock on the left, but not with a new store impossible to use (and to remove!). The kindle app, which is the main reason I purchased the Onyx Note, has become very slow and dramatically inconsistent in turning pages, forcing me to use the A2 mode! I am starting to question the soundnes of my purchase and starting to look elsewhere if things aren’t fixed soon. I’m sorry as I really wanted to like rhis device. It wasn’t perfect before this update of course, and certainly had plenty room for improvement, but It still was worth it awaiting for software improvements. Now I cannot, in good conscience, recommend this device. Hi, thanks for the review. I wish I waited with installation till reading this. Alas, I plunged in as soon as the update was out. I fully agree with your feelings, I hated this update since the first minute of using it. More than that, some features I used before, disappeared. For example, the option to scan metadata in the library was gone, as well as some others. Also, the device became unstable, I observed funny behavior of battery since the update, random freezes, etc. Suffice to say that I have just went down to the previous firmware. It looks as before, the only loss (noticed so far) was the library structure but the books were not removed from the device. I will see if the stability and battery issues are gone – perhaps these are hardware problems of my unit. I saved this update and I am going to keep it around. I certainly did not expect such a mess with this software. Thanks for your blog and keep up the great work. Thank you all for this warning – I was already downloading the update when I hastily aborted it after reading your complaints. I love eInk and I like that there is no distraction, nice contrast and everything. I can live with a slight lag when writing that is almost unnoticeable and I like Android more than iOS because you can at least use F-Droid without rooting / jail-braking. But if this doesn’t get better until Q2/3 I will definitely try alternatives. Ciao a tutti, io ho un note aggiornato alla versione 2.0.1, e non mi fa piu sincronizzare le note con dropbox, in pratica quando vado a scegliere le modalità di sync clikkando non compare nulla. qualcuno sa come risolvere il problema?